The Empire style in the interior appeared in the era of the reign of Emperor Napoleon. His main task was to represent the government, emphasizing status and unlimited possibilities. 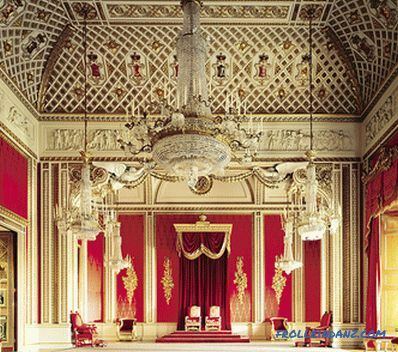 Another name for the style is imperial or palace. After all, according to the canons of Empire style, the interiors of the palaces of the French and Russian emperors were built. They are majestic and monumental, they are characterized by official pomp and severity. Empire - this is how the name of the style is translated from French. Creating his empire, Bonaparte sought to unite vast territories and various peoples under his command. The common link should be common cultural traditions. However, the severity of classicism prevailing in European capitals at the end of the 18th century was not suitable for this purpose. Therefore, in the first decades of the 19th century, a new style was formed in architecture, painting, literature, and of course, the interiors of the rooms. 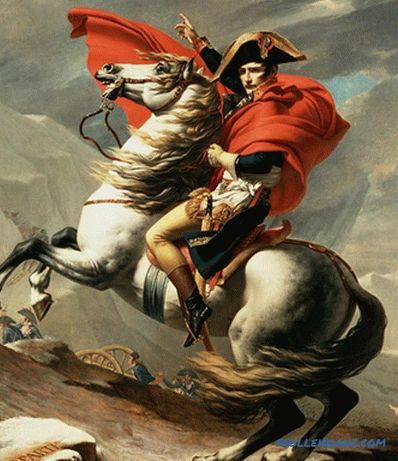 The French painter, who exalted on his canvases the emperor and his retinue, Jacques Louis David, worked on the creation of the Empire style. He praises the feats of arms of the ruler, depicting him on horseback on a hot horse. 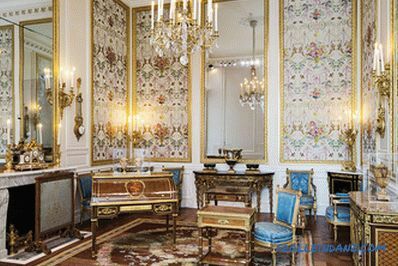 In addition, he makes beautiful lacquered furniture, decorated with expensive mosaics and ornaments, and presents Josephine. This approach was very generously appreciated by the authorities. David begins to make large orders, he becomes known. Under the influence of monumental paintings by Jacques Louis, architecture is also developing. For the ruler rebuild grand palaces, admiring their beauty and pomp. Famous are the names of architects Pierre Fontaine and Charles Persier, who updated the Tuileries and the Louvre. Famous furniture sets in the Empire style were made according to their designs. The interior of the Louvre. 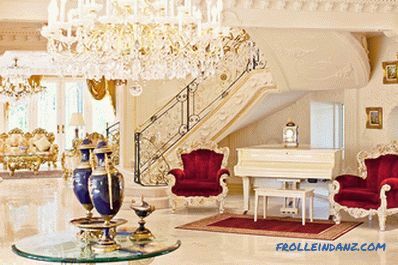 Empire-style interior design has penetrated into Russia. The influence of French culture was great at the beginning of the XIX century. Eminent persons invited French tutors, painters, architects. It was fashionable not only to dress in French style, but also to express one's thoughts with the help of a foreign language. For the construction of palace complexes and cathedrals, Henri de Montferrand and Carl Rossi were invited to Russia. In their performance the Empire style sounded softer and more plastic. 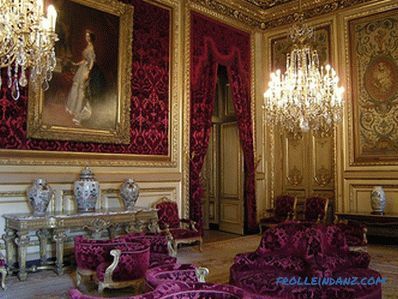 The French Empire style in the interior extols Napoleon, therefore it is inherently ostentatious and greatness. The origins of the style go to ancient Rome with its grandeur and grandeur. 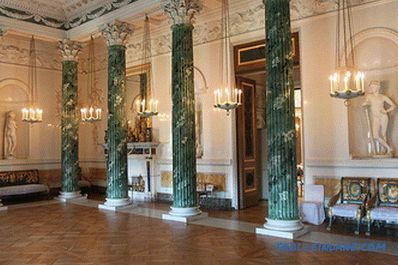 Many interiors are decorated with columns, antique sculptures, bulk moldings. For finishing surfaces using natural wood, mirrors, bronze. The walls are decorated with paintings and portraits in massive frames. The ceilings look like works of art. They are supplemented with carving, stucco, gilding. 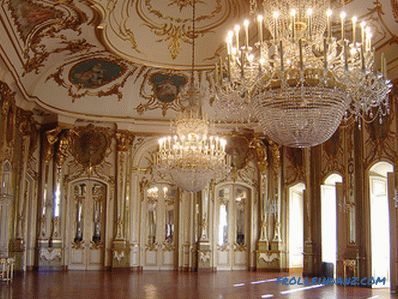 Their main decoration are magnificent chandeliers with crystal pendants. Furniture in the ampire looks thoroughly and effectively. Its appearance is influenced by the events of the military campaign in Egypt and the fascination with the Roman traditions. Chairs with straight backs adorn lining with lion heads, their legs are shaped like lion's legs or Roman columns. 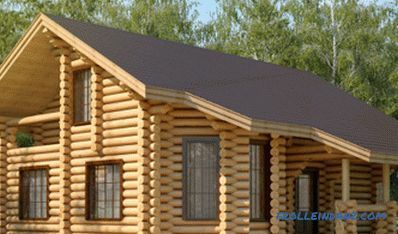 For the manufacture of furniture using valuable wood, natural marble or porphyry. 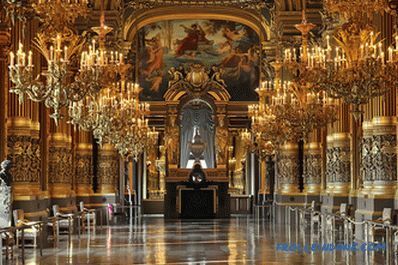 The French Empire style is the style of halls for official receptions and special occasions. It is designed to delight and captivate, to conquer at first sight. Empire style is more suitable for the design of offices, ceremonial halls, large dining rooms and living rooms. Less often with its help make out bedrooms. The fashion for everything French appeared under Emperor Paul. However, importing furniture bought in France into Russia was strictly prohibited. This ban was also maintained under Alexander I. 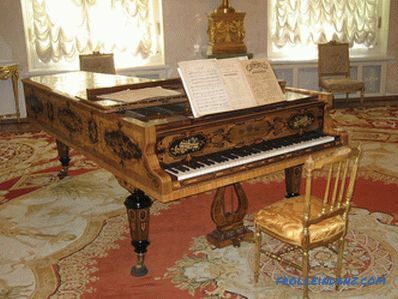 However, during his reign, Empire-style furniture began to be produced in Russia. Albums with sketches of the best architectural buildings, interiors, and furniture are transmitted to Alexander I from France. The furniture is ordered to the best craftsmen who make it from mahogany and Karelian birch, decorated with mosaics and carvings. However, it turns out not so heavy and straightforward. 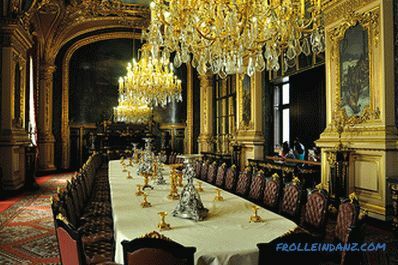 Furniture made for the capital is most similar to the French original. Orders for the province (Moscow landowners) have soft forms, they are not so elegant and official, they have a more homely appearance. So "Russian Empire" is divided into two types - the capital and provincial. 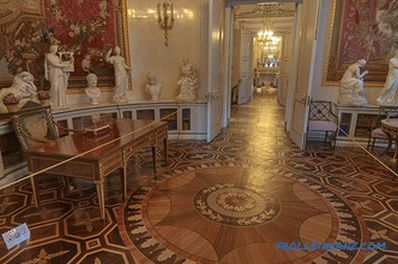 For the palace interiors of St. Petersburg ordered furniture made of mahogany or rosewood with gilded lining, and magnificent mosaics. For upholstery used silk or velvet. For Moscow interiors, they made wood furniture of more simple species - ash, walnut, linden. A chintz was used as an upholstery. 1. 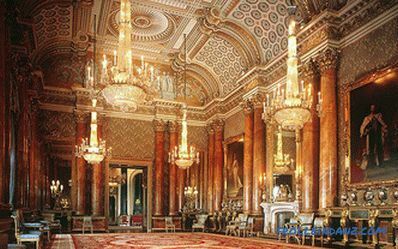 A large area and grandeur is the main feature of the style.The Empire style is a historical style denoting the interiors of palaces and residences of emperors. It gives the rooms a majestic and solemn look. Today, it is chosen for the decoration of status rooms in high-class hotels, interiors of country houses and forks, banquet rooms in restaurants. 2. Using centric composition. The principles of surface finishing and furniture arrangement in a large room are most often built on a radial or centric composition. As a rule, the center of the floor and ceiling is underlined by a pattern. 3. Antiquities and military glory for interior decoration. Sculptural groups, porcelain vases, and bronze candlesticks are set up around the perimeter of the hall for ceremonial receptions or the main living room. 4. Large mirrors. I use them to underline the brilliance of gold surfaces and to reflect the grandeur of the setting. The mirror must be large, decorated in a massive frame. 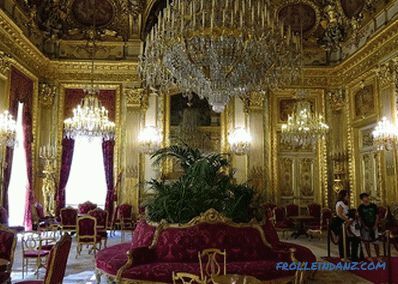 For interior design in the Empire style, the main color is gold. It is he who is meant to emphasize the power and status of the palace atmosphere. 1. White color, giving the impression of sophistication and elegance. 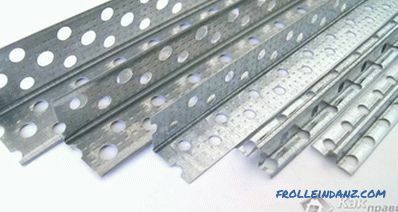 This combination is typical for the decoration of ceilings and walls. 2. Red, wine red, emphasizing strength and high ranking. It is most often used for textile design (red carpet, upholstery of sofas and chairs, curtains). 3. 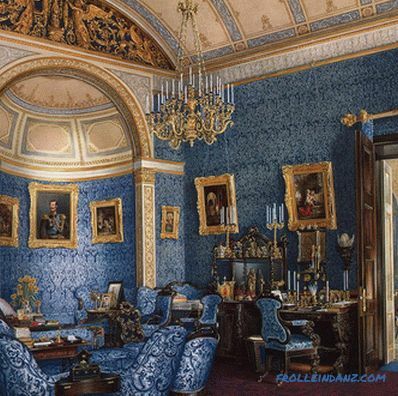 Noble blue, radiating cold energy, was used to decorate living rooms or boudoirs. In the Empire, it is less significant in status than the red color. Accordingly, it was used for the decoration of less important premises. 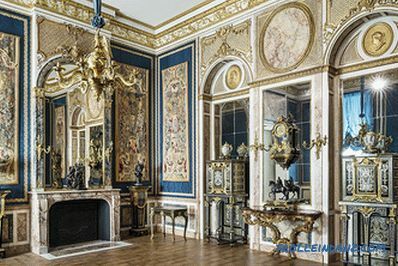 Walls in the Empire style - this is not just an inconspicuous background for paintings and mirrors, this is a precious facet. They were decorated, like all surfaces, with stucco, gold patterns. For wall decoration do not use wallpaper, rough stonework or plastic panels. These materials are prohibited. 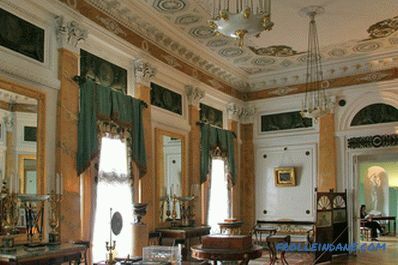 to decorate the walls with family portraits in governmental poses and outfits the beginning of XIX century. A room in an imperial style necessarily has high ceilings. This is an important condition that you should pay attention to when creating a modern interior design in the Empire style. If the country villa has two floors, and the rooms have high ceilings, they can be stolen royally. For a small apartment with low ceilings, such methods will not work. the larger the ceiling area, the more chandeliers on its long pendants illuminate it. 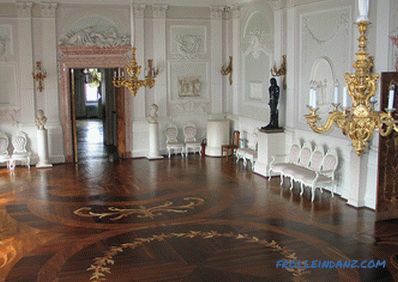 The Empire style in the interior is repeatedly emphasized by the beauty and uniqueness of floor patterns. 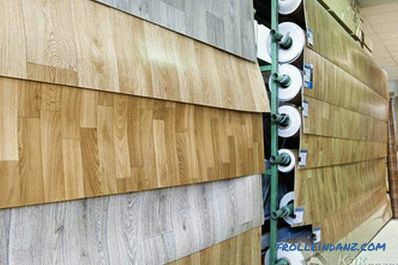 For finishing the floor used natural wood of various breeds. Most often, the floor laid out the floorboard in an artistic way. To create a picture used floorboard of light and dark wood. The drawing is necessarily symmetrical, often begins not from an angle, but from a cent. The floors in the living room and bedroom are decorated with expensive handmade carpet. As a rule, he has an ornamental pattern in blue-gold, red-gold or white-gold tones. 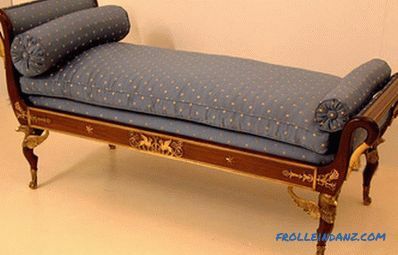 Empire-style furniture tends to be formally ceremonial. Small forms, feminine elegance and ornateness are alien to her. Use of natural expensive materials for the body and upholstery. Smooth lines delineating shape. Furniture for the room is selected from the same wood species. An ornamented surface, with the basis of the ornament being flowers and geometric shapes, often with a gold finish. Copying pieces of furniture from Ancient Rome and Greece. 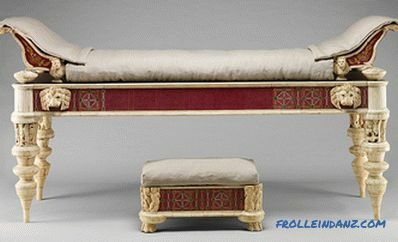 A striking example is the Roman bed, on one side of which there is a headboard, and on the other - an armrest. 1. 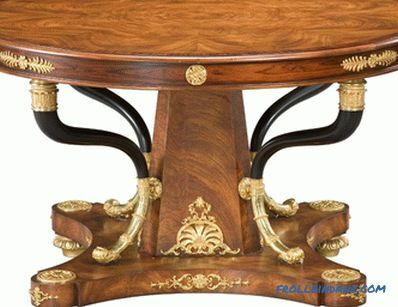 A low round table on one support.It was made of valuable wood, decorated with inlays, carvings and gold ornaments. 2. Showcase with a characteristic finish and glass shelves. With a decoration of bronze patch details, sculptural details. 3. 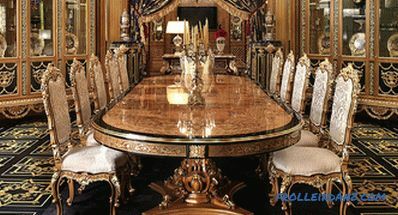 A large dining ceremonial table surrounded by high chairs. For the dining group often used complex technique of decorating surfaces - Merketri (mosaic using valuable species), artistic carving. 4. Exclusive musical instruments, decorated with mosaics. 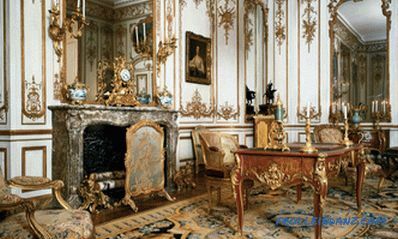 During the Bonaparte era, interiors were decorated with bronze bands: candlesticks, chandeliers, sculptures, and watches. They were distinguished by a special quality of embossing, alternation of matte and glossy surfaces, symmetries and harmony of appearance. 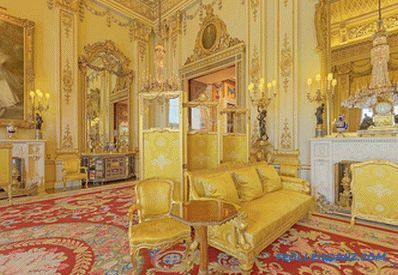 A special place of the interior in the Empire style was occupied by chinaware, portraits and mirrors in three-dimensional gilded frames.